I’ve been working on my Mortach’s mount over the last couple of days. I’m pleased with how its turned out, although looking forward to see how this all works combined with a finished Mannfred soon. 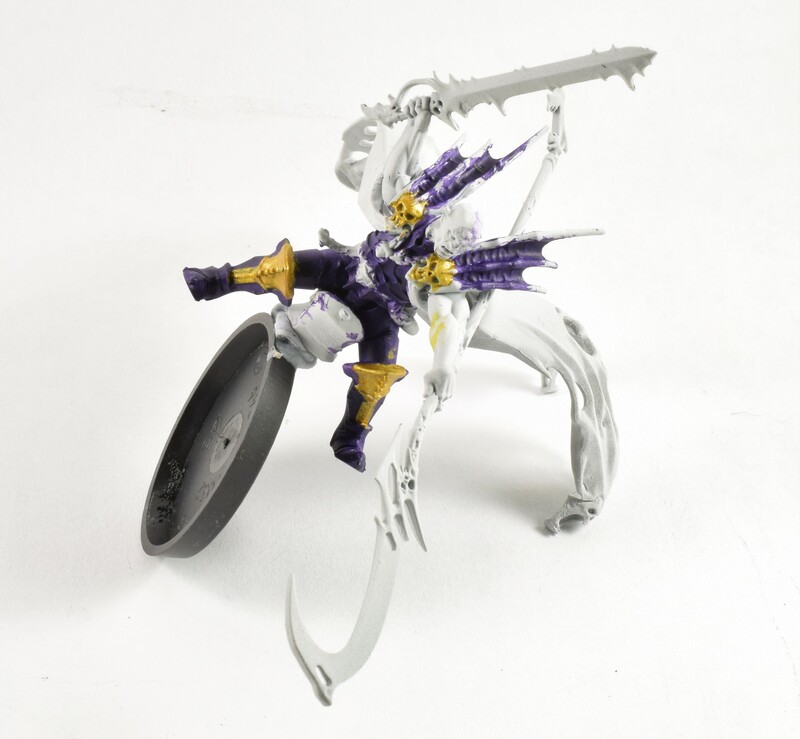 In addition to him, Neferata, Arkhan and their respective mount features are magnetised to allow me to change the rider easily. I’ve left the beast’s armour panels loose, but they clip in really well. Because I wanted to use the same mount for all of the different rider options, as well as fit the paint scheme for the rest of the force more closely, I painted the creature in standard skeletal style. I decided to paint Mannfred first – here he is in a very rough early layers stage. I’ve done a bit more work on him blocking in the main colours since taking this photo, but I’m hesitating over how to paint his weapons and cloak given I don’t want to overuse the main ethereal colour. On a final note, I’m not too worried about the Death warscroll leaks swirling around as it’s impossible to consider them, if these are legitimate, out of their larger context. Lovely job mate – good call magnetising the rider!! Very clean ghostly effects. I really like it so far. If I ever get done with my Thousand Sons I might try and resurrect my little Nighthaunt host. I’ll try and bring them out for a bit of paint. Great texture on the bone you got!